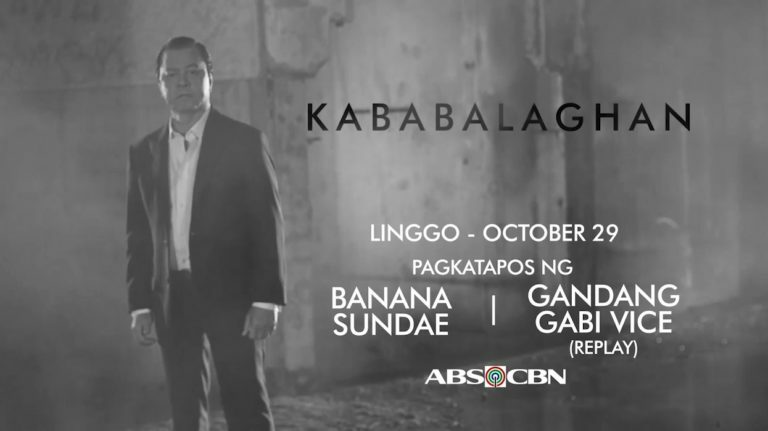 Halloween is not complete without veteran broadcaster Noli De Castro’s “Kababalaghan” TV special and this year, Kabayan promises four stories that will bring friends and families together for a good scare this Sunday afternoon (October 29) after “Banana Sundae” and once again after “Gandang Gabi Vice” on ABS-CBN. The first story involves veteran TV host Cory Quirino, who experience being haunted by a spirit living inside an antique Bu-lul fertility idol that her then husband brought to their home. She and their househelp started to feel eerie around the house until a dark and creepy creature finally appeared before them and spoke to them. The second story is about a woman who practiced witchcraft and was possessed by many demons. She was able to hide her identity and even served as a choir member, until a priest came to visit their church and felt that an evil presence is entering her again. The second story is about a woman who practiced witchcraft and was possessed by many demons. She was able to hide her identity and even served as a choir member, until a priest came to visit their church and felt that an evil presence is entering her again. This led to the woman revealing her past where she admitted to have hurt and killed many people using her powers. In the third story, Kabayan will take us to the old Clark Air Base hospital, which has been a popular destination for ghost-hunting. Built in the ‘60s, the facility treated wounded American soldiers who fought in the Vietnam war. Up to this day, the spirits of those who did not make it continue to haunt the abandoned hospital. To wrap up this year’s “Kababalaghan” special, Kabayan will also visit the old house in Sta. Mesa, Manila where lost souls are said to be staying. The family renting the worn down house said they have experienced many scary instances that prove they are not alone in their home. Even the neighbors have attested to seeing ghosts and even elementals in the building beside the haunted house. Find out the stories behind the scary experiences of these Kapamilyas and witness what action was done to bring back peace in their lives on Noli De Castro’s “Kababalaghan” special this Sunday afternoon (October 29) after “Banana Sundae” and once again after “Gandang Gabi Vice” on ABS-CBN and ABS-CBN HD. Watch online via iwantv.com.ph or skyondemand.com.ph.